Reliance Jio Infocomm (RJIL), the subsidiary of Reliance Industries led by Mukesh Ambani recently announced a premium membership plan exclusively for the users of Jio who will join the network before March 31, 2017. 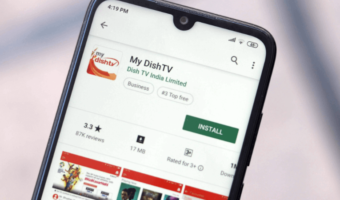 The subscription enrollment officially began yesterday, and at the same time, Jio revealed some more new plans for both JioPrime and non-JioPrime users. 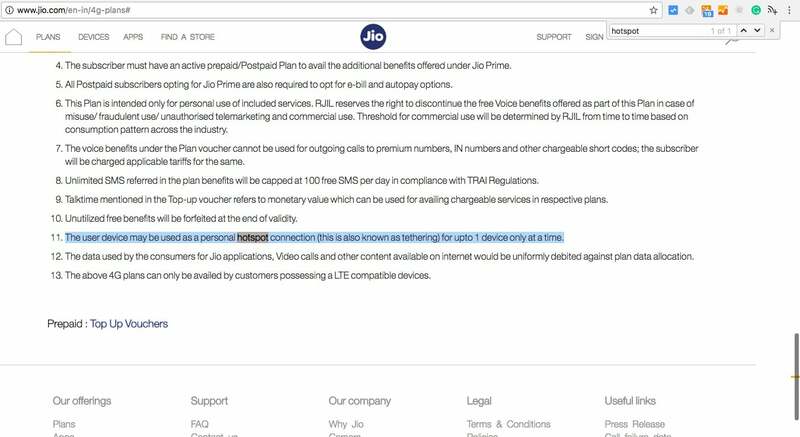 While the new plans JioPrime plans stolen the show at one end, it was Jio’s misleading terms and conditions of the plans that is creating a lot of buzz on the internet. One of the terms and condition mentioned in the plan states that “The user device may be used as a personal hotspot connection (this is also known as tethering) for up to one device only at a time.”, which is completely misleading. With that said, we have contacted Jio on their toll-free customer care number regarding the same query. And the reply from Jio’s executive will amuse you. 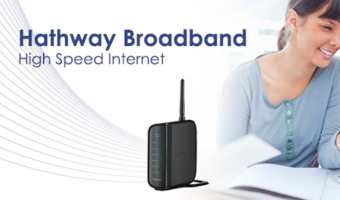 The care executive claims the t&c as a wrong one and even answered that ‘A user can connect as many devices as he can, but the speeds will decrease with usage, and if you connect to one device, the speeds will be as usual,’ which of course, everyone knows. 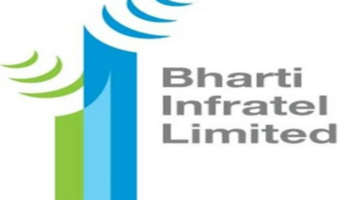 As everyone might be aware of the fact that: if a device is used for creating an hotspot, a maximum of five devices can be connected and some manufacturers tweaked this and extended the connection support for ten devices such as Reliance. All the Reliance Lyf smartphones can be used to connect a maximum of 10 devices at a time. But, that isn’t the case with all the Android devices. All said and done, we have approached Jio internally, and the company is yet to respond us regarding the issue. 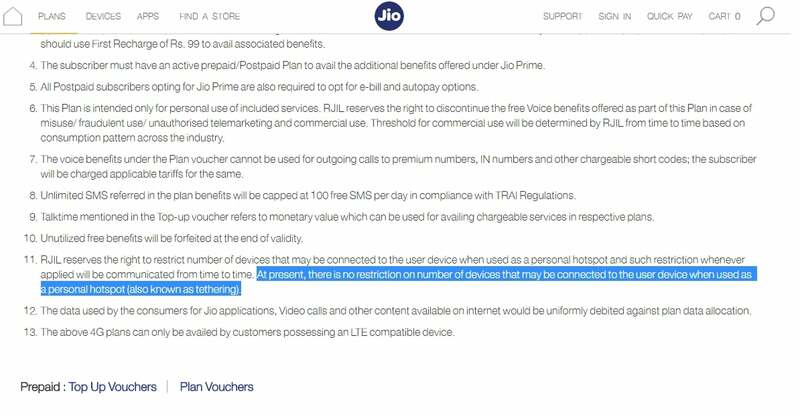 Also, some rumours are claiming that the plans under Jio Prime subscription won’t be offering unlimited night data. Jio officially confirmed to TelecomTalk that the endless night data from 2 AM to 5 AM will end with the ‘Happy New Year Offer’ itself on March 31, 2017. Will the Upcoming Metal-Clad Moto G5 Plus Outshine the Budget Beast Xiaomi Redmi Note 4? Hopefully now with NO FREE NIGHT DATA + ONLY ONE DEVICE + CHARGES (BOTH PRIME ENROLLMENT AND MONTHKY 303) the speeds in Jio can become stable and reliable.